The Hello Kitty sewing machine by Janome, with its cute colors and design, is not just for kids. 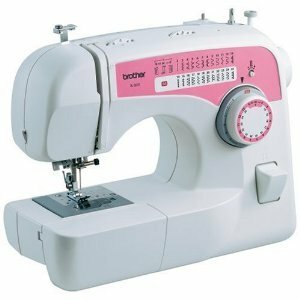 It has features not found on many children’s sewing machines, and quite a few adults choose it for a second sewing machine for simple projects and because it is small and lightweight. FREE Beginner Sewing Video Course! This 5 lesson video course will walk you through everything from threading your machine and winding the bobbins–to troubleshooting and maintenance. View the videos anytime or anywhere. Just don’t miss out. Sign up for your FREE course now! 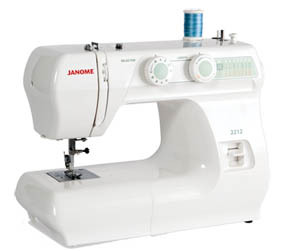 Janome sewing machines have a long-standing reputation for reliability, and that includes this model. This Janome mini sewing machine, Janome 11706, is adorably cute, as well. Not really a toy, many adults purchase the Hello Kitty for travel, classes or simple projects at home. If you are considering a sewing machine to teach your child or grandchild to sew on—the Hello Kitty sewing machine might be a good choice for you. This model, the 11706, is a ¾ size sewing machine. There is another Janome Hello Kitty that is ½ size. That sewing machine, model 11702, is NOT being reviewed in this article, and it is more like a toy than the 11706. Size – not too big and not too small, the Hello Kitty weighs in at just 12 pounds. It is totally portable and can be easily taken to classes or quilting groups. Many owners use it for smaller projects at home, instead of dragging out their heavier sewing machine. Quiet and smooth – Owners love the smooth, almost noiseless operation on so small and simple a machine. Heavy duty construction – Made to last. Since the machine is constructed well, you can travel with it and not be concerned that it will fall apart. Built-in light and on/off switch – The blue Hello Kitty (model 11702) does not have these features. Instruction book – has clear, step by step instructions. Great for beginners. Cute – I don’t want to de-emphasize this. 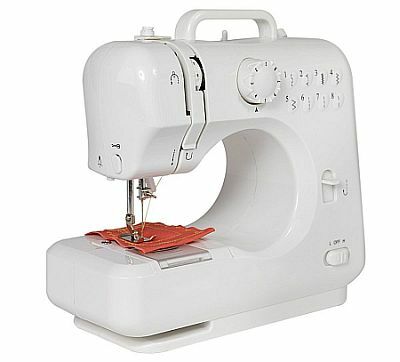 Reviewers just love sewing on this machine. Working with a fun design on the machine makes sewing more fun! 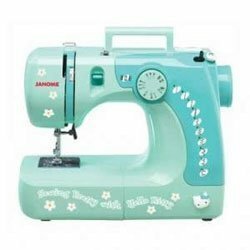 As you can see, the Janome Hello Kitty Sewing Machine is more than a children’s sewing machine or a first sewing machine. Many experienced sewers choose to get one for craft projects, scrapbooking or for simple projects that don’t require their more complicated sewing machines. If you are considering a gift for a sewer or a sewer-to be, make sure you don’t overlook the Janome Hello Kitty sewing machine 11706. You can purchase this machine at Amazon . Love that FREE shipping!